How are quilt squares made? What are the guidelines for hanging the squares? How are quilt squares made? The quilt squares are made of two MDO boards cut into 4 feet by 8 feet sections. When hung the squares are 8x8 feet. The wood panels are primed twice on both sides to prevent fading and warping. This is a very important step in keeping the promise of longevity for the squares. After priming the pattern is drawn on the panels by Walt Rybka and Carita Bergelin. This is no easy task since the panels must be precise mirror images of each other and sit centered on the panels when hung. 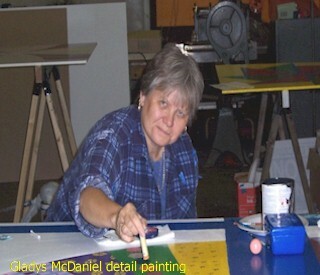 Members of the Quilt Square Trail Painting Team led by Carmileta Evans and other volunteers paint the pattern onto the panels. Sometimes the colors and pattern are dictated by the sponsor but other times the committee chooses them. After drying the panels are ready for hanging. A special frame is constructed by Walt & Carita for attachment to the barn or other structure. Once all parts are delivered to the site, the hanging process is scheduled. Where are they made? The panels are presently made in the printing room of the Morehead News which they no longer use since the digital age changed printing methods. It is perfect for this project because it has plenty of room for large scale panels. Painting team members are free to come and go during regular business hours to work on several projects at the same time. Also, some panels were constructed and painted in the Cave Run Arts Association http://caverunarts.org/ Gallery on Main Street in Morehead, Kentucky. One was constructed in a privately owned garage. Who hangs them? The hanging of the panels is done by a number of different people. The very first panel was hung by Morehead State University http://www.morehead-st.edu/ Physical Plant employees. Volunteers led by Jack Williams and Duane Catron have personally hung many around the county. Many others have been hung by (RECC) Grayson Rural Electric Company employees http://www.graysonrecc.com/ on a voluntary basis including: Richard Easton, Herbie Steagal, David Holbrook, Donnie Martin, Scott Speaks, Chris Mosier, Kyle Clevenger, Billy Ray Wilson, Mark Hutchinson, Steve Bush, Dustin Everman, Kaly Clevenger, and Dale Littleton. The Folk Art http://www.morehead-st.edu/kfac/ Museum square was installed by staff member - Matt Collinsworth. The Rowan County Kentucky Foothills Quilt Square Committee is extremely grateful for the cooperation and time and effort these folks have contributed to this project. Guidelines for Placement of Quilt Squares. The Foothills Quilt Trail Committee makes decisions about where to place quilt patterns after applications are received. A decision was made by the Committee to place the patterns on main roads into and out of Rowan County on barns, which would be highly visible. This is our number one priority. Donations are accepted for these quilt patterns and are tax deductible. Additional funds received by the Committee are available to pay for some of these quilt squares. Other patterns to be put up in less desirable locations (off the main roads and not highly visible sites) should be funded by the barn owner or others that want to be a sponsor. Cost is $250.00, subject to change if needed supplies rise in price. Grant funds cannot be used for these quilt block squares. Barn owners may pick the design and colors or allow the committee that option. Patterns should be geometric - not appliqué. Patterns can not be duplicated within the County. More funding has been received from the Paul and Lucille Little Foundation so the committee will be able to fund 20 more quilt block squares until October, 2009.